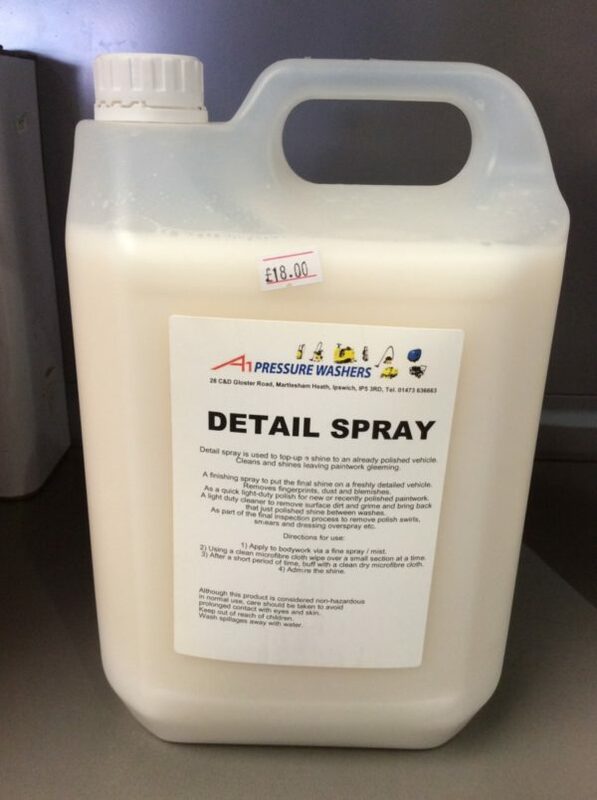 5 Litres of Detail Spray. Detail spray is used to top-up a shine to an already polished vehicle. Cleans and shines leaving paintwork gleeming. A finishing spray to put the final shine on a freshly detailed vehicle. Removes fingerprints, dust and blemishes. As a quick light duty polish for new or newly polished paintwork. A light duty cleaner to remove surface dirt and grime and bring back that just polished shine between washes. As part of the final inspection process to remove polish swirls, smears and dressing overspray etc. 1) Apply to bodywork via a fine spray/ mist. 2) Using a clean microfibre cloth wipe over a small section at a time. 3) After a short period of time, buff with a clean dry microfibre cloth.